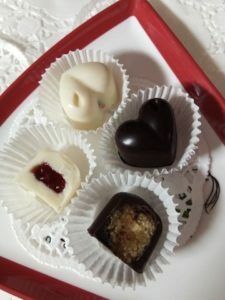 Rani Rodrigo, known for her home-made cakes and chocolates is offering special gift-wrapped boxes of chocolates for Valentines’s Day. They are being made at her place in San Thome. A box of 12 chocolates, weighing about 150 gms is priced at Rs.150. This entry was posted on Friday, February 1st, 2019 and is filed under Sales, Shopping. You can follow any responses to this entry through the RSS 2.0 feed. You can skip to the end and leave a response. Pinging is currently not allowed.